Best Choice Products is proud to present this brand new Folding Rocking Chair. This red rocking chair is made from steel & treated with a powder-coated design to prevent rust. A detachable nylon cord attaches the frame to the UV-resistant mesh fabric and can handle a weight capacity of 250 lbs. Moreover, the mesh can be cleaned easily with a damp cloth. The chair features a locking system located to the right that allows the chair to be in a secured upright position. Armrests give the user the ability to comfortably enjoy a tasty beverage. Along the top of the chair, a pillow drops down & may be flipped backwards to give you the option of using or not using the pillow. Lightweight & easy to move, this chair can be folded for easy transportation & storage. 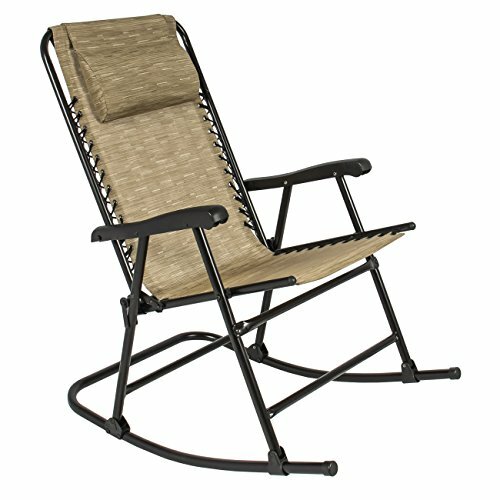 Rock at home or on the go with the Folding Rocking Chair by Best Choice Products! SPECIFICATIONS: Overall Dimensions: 25”(L) x 36.5”(W) x 42”(H); Legs: 33”(L); Armrest Dimensions: 15.5”(L) x 2.25”(W); Pillow Dimensions: 12”(L) x 7.5”(W) x 2”(Thickness); Backrest: 20.5”(W) x 25.5”(H); Seat: 18.5”(L) x 20.5”(W) x 20.5”(H); Weight: 17 lbs. ; Weight Capacity: 250 lbs. ; Color: Red; No assembly required.